Enhanced, even more powerful extension of existing CISCO UC environments. The most versatile 3rd party tool ever created for CISCO UC systems. Increased productivity for users and administrators - maximum simplicity! TIM8 – Think outside the box. TAKE A LARGE STEP INTO THE FUTURE WITH TIM8! TIM8 is about to be released and starts a new era of increased productivity & simplicity. 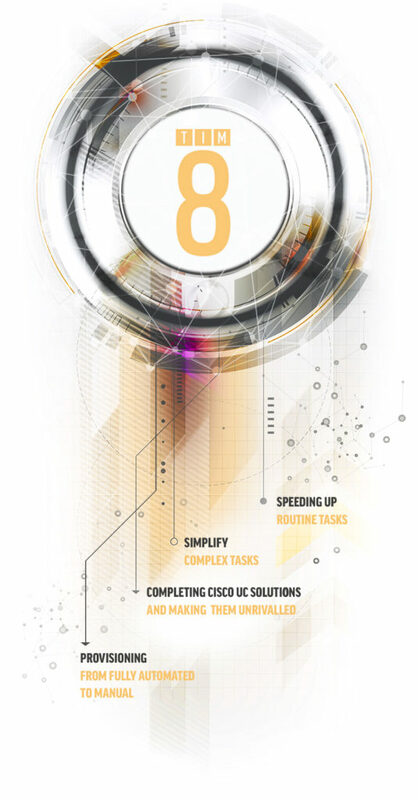 Simplify complex tasks with TIM8 and save resources in the processing of routine tasks. The main focus has always been on the realisation of unlimited possibilities – as individually adaptable as the customer’s demand. From fully automated to manual provisioning, TIM8 knows no limits. With intelligent and innovative add-ons, TIM8 turns the CISCO UC environment into the VoIP system on the market.